* Not really, I'm lying but it might get people to look. No actual Hippies were injured in the making of this web log. and share any creative endeavors of my own. The Bus Boys were an L.A. based band that really rocked. Those who have heard them have never forgotten them, especially not with a kicking song like this featuring vocal parts by five of the boys and great lead guitar by Victor Johnson. 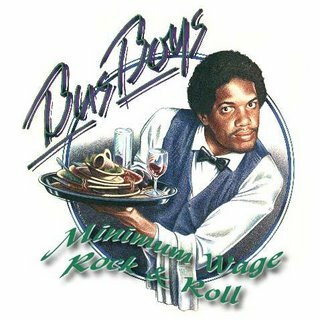 Arista released their debut album Minimum Wage Rock & Roll in 1980. Brothers Brian and Kevin O'Neal wrote most of the songs on it and the follow up from 1982 American Worker. Whether they all actually daylighted in resteraunts I don't know but on stage and in publicity photos they dressed as though they did, even posing in Madam Wong's on the back cover of this album. There's a line in Did You See Me? "bet you never heard music like this by spades" as aside from Asian drummer Steve Felix this rock band was black. Another track from their debut, There Goes The Neighborhood, complains about whites moving into the inner city, while KKK equates being black in a rock group with another fish out of water concept. D Day is a great Funkadelic style party song which seems likely to have inspired Fishbone's later Party At Ground Zero. While American Worker was fairly recently issued on CD, Minimum Wage seems to have had only one CD release... in Europe over ten years ago and practically impossible to find. This was the first vinyl I burned to compact disc (on a sunny spring day in S.E. Alaska) and there is a little hum from not having the line grounded properly. Back in the day I would sing this song to myself while weeding a grocery store's parking lot on a Sunday. I love a wide variety of music, new and vintage (often looking for Canadian and British folk and psych). I also have a longstanding fondness for quality Children's books, comics and entertainment, especially related to puppetry and stop-motion animation.